Random Stones Stamped Concrete MatsThere are different mold models, but it is the same Mold style. I..
Random Stones Stamped Concrete MoldsThere are different mold models, but it is the same Mold style. .. Concrete Stamp Rotating Mats SM 1910All SM 1910 series stamp mats are rotating&.. Concrete Stamp Rotating Mats SM 2000All SM 2000 series stamp mats are rotating a.. Concrete Stamp Rotating Mats SM 2100All SM 2100 series stamp mats are rotating a.. Rotating Concrete Stamp Mats SM 2200All SM 2200 series concrete stamp mats are r.. Concrete Stamp Rotating Mats SM 2300All SM 2300 series stamp mats are rotating a.. Tumbled Edge Slate StoneStamp Dimensions:24" x 24" (61.50cm x 61.50cm) approximatelySize of each sec.. Concrete Stamp Mats SM 2301, 36" x 24"
Concrete Stamp Rotating Mats SM 2301All SM 2301 series stamp mats are rotating a.. Concrete Stamp Mats SM 2302, 24" X 12"
Concrete Stamp Rotating Mats SM 2302All SM 2302 series stamp mats are rotating a.. Concrete Stamp Mats SM 2303, 24" x 24"
Concrete Stamp Rotating Mats SM 2303All SM 2300 series stamp mats are rotating a.. Concrete Stamp Mats SM 2304, 12" x 12"
Concrete Stamp Rotating Mats SM 2304All SM 2304 series stamp mats are rotating a..
Dimensions:24" x 24"Suggested Detailing and Touch-up and Tools:Touch-up Texture Skin: SKM 3000Chisel.. There are different mold models, but it is the same Mold style. If you use them together, your patte..
GlobMarble Concrete Ashlar Slate StampsThere are different mold models, but it is the same Mold styl..
GlobMarble Concrete Slate Stamps. 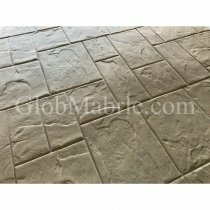 Herringbone PatternThere are different mold models, but it is the ..
GlobMarble Travertine Stone Stamps SM 6000Dimensions: 32" x 24" (81.50 cm x 61 cm)Recommended Contra.. Concrete Stamp Rigid with handles and Flex without handlesStamp size: 43½" x 21¾" (111 cm x 55.50 cm.. Concrete Stamp Rigid with handles and Flex without handlesStamp size24" x 24" (61 cm x 61 cm) approx.. Concrete Stamp Rigid SM 7000/1 with handlesStamp size: 31" x 21" (79 cm x 53 cm) approximatelyTo hav..